The Yankees taking batting practice recently. Photo by Jason Schott. When the Yankees beat the Detroit Tigers 3-1 on Monday night at Yankee Stadium, they hit a milestone. This was their 500th win at the new Stadium, which opened in 2009. The Bronx Bombers are the quickest team to reach 500 wins in a new stadium since the Braves went 500-305 from 1997 to 2006 at Turner Field. 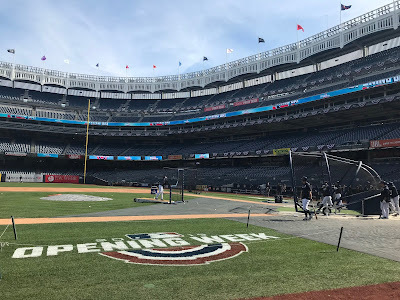 The all-time record for fewest losses at a stadium at the time of a team's 500th victory was set by the Yankees at the original Yankee Stadium, 500-264. The Yankees' overall home record in the 10+ plus years at their new ballpark is 500-314 (.614 winning percentage) and it is the best in baseball since 2009. The Los Angeles Dodgers were next up with a record of 488-315, followed by the St. Louis Cardinals (478-332), Boston Red Sox (463-347) and the Detroit Tigers (454-355). Yankees Senior Vice President/General Manager Brian Cashman needs just three wins to reach 2,000 wins as General Manager. Cashman is in his 22nd season at the helm, was named GM on February 3, 1998. The Yankees have a major-league best .587 winning percentage, with a record of 1,997-1,406-2) over 3,405 games in his tenure. Their 1,997 wins since 1998 are 102 more than the second-best team, the Red Sox, who have a record of 1,895-1,512 since then.